For push to work with an Exchange Server — at press time, anyway — your company must be simpatico with one of the last several iterations of Microsoft Exchange ActiveSync. Ask your company’s IT or tech department if you run into an issue. 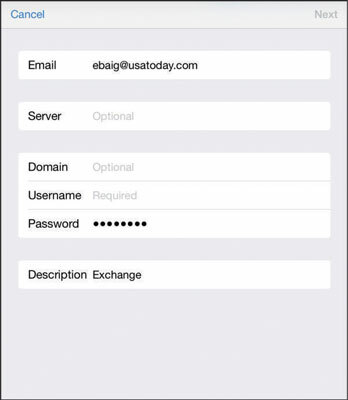 Setting up Exchange e-mail isn’t particularly taxing, and the iPad connects to Exchange right out of the box. You still might have to consult your employer’s techie-types for certain settings. Tap the Exchange listing on the Welcome to Mail or Add Account screen. Fill in what you can: your e-mail address, domain, username (sometimes), and password. Or call on your IT staff for assistance. Tap Next when you’re done. On the next screen enter the Server e-mail address, assuming that the Microsoft Autodiscover service didn’t already find it. Tap Next when you’re done. That server address may begin with. Choose which information you want to synchronize through Exchange by tapping each item you want. You can choose Mail, Contacts, Calendars and Reminders. When one of these switches is turned on, a green button is visible; otherwise what you see appears dimmed. The company you work for doesn’t want just anybody having access to your e-mail — heaven forbid if your iPad is lost or stolen. So your bosses may insist that you change the passcode lock inside Settings on your iPad. (This is different from the password for your e-mail account.) If your iPad ends up in the wrong hands, your company can remotely wipe the contents clean. You can choose how long you want the iPad to keep e-mail synchronized. Head to Settings; tap Mail, Contacts, Calendars; and then tap the e-mail account using ActiveSync. Tap Mail Days to Sync and tap No Limit or pick another time frame (1 day, 3 days, 1 week, 2 weeks, or 1 month). 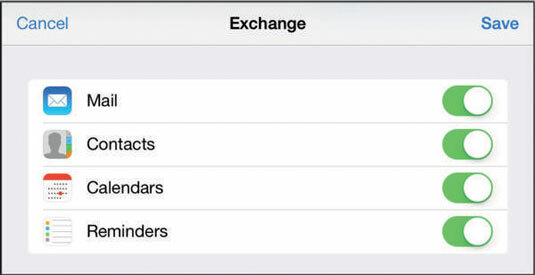 If you’re moonlighting at a second job, you can configure more than one Exchange ActiveSync account on your iPad; prior to iOS 5, there was a limit of just one such account per device.